I was inspired by Linh (Blushology) to get a planner to organize my life. I've identified that I'm a habitual scratch paper and post-it's girl, which is odd because I was a Planner girl back in college. What happened to me?? Anyways, in addition to all the things I need to or want to remember about my family and all the things I need to remember for work, I also wanted to keep track of my fitness progress. I bought a cheap planner from Target to try my hand at organizing myself this year. I get lost when there is a full month calendar at the start of each month followed by the weekly schedules behind it. I wonder if I should put everything I do or need to remember in the weekly section as well as the monthly section. I paralyze myself with the process of how to organize that I just don't organize anything at all! So, I'm actually getting a little bored with the Jung Dayeon Figure Dance workouts I've been doing for the last 3 or 4 weeks. They're good but I just need to insert a little change into it. 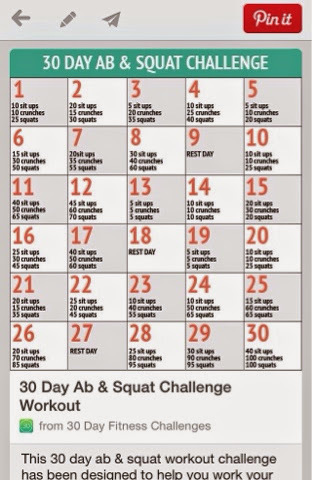 So my hubby and I are going to start a 30-day fitness challenge. I'm loving it because it's something my husband and I get to do together, and it's low impact so we don't injure ourselves. I'll be back with an update later!! Any one else trying to keep a fitness routine fresh and exciting?